On your Mac, sometimes you urgently require clearing some space on the hard drive. Either to copy new files or because you Mac storage is now overloaded. It is not an easy task to manually choose and delete files immediately. But here is an application that will make things easy for you and immediately find and delete large files on Mac. Developed by Systweak Software, this app is the best Mac optimization solution you can have. 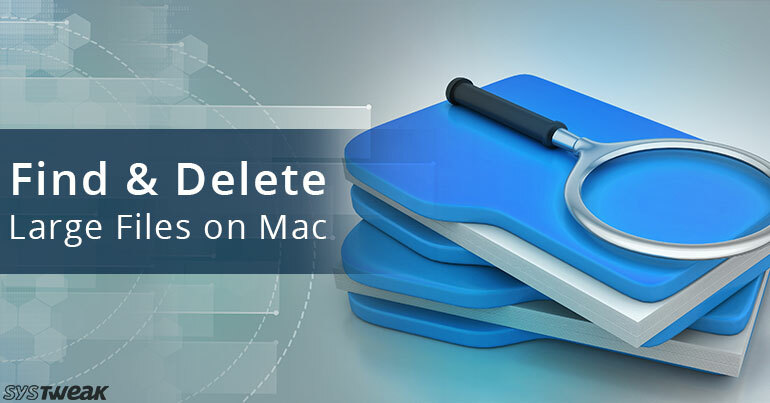 It not only cleans junk from your Mac, but also helps identify and delete any space hogging files easily and quickly. You can download this application from the given link. You will find many options in the application when you will be on the home screen as it is not only meant for detecting and cleaning duplicate files, it also performs many tasks to tune up your Mac. You will see type of files and size occupied by them. By clicking file types, you can see large files of that type and you can delete large files from here only. This is how application helps you to delete large files on Mac. Apart from this application also helps you to delete junk and unnecessary files in just one click. Application is also having a feature to optimize other apps. If you want to give a try to the manual method of finding and removing large files then here are some tips and tricks. Windows are having a feature to arrange files according to their size and Mac OS X is having a feature to locate files according to size. To find large files manually using finder follow these steps. Open Finder on your Mac. To access find menu go to file and then click on find from the upper menu bar or you can press and hold command keys. Choose Kind > Other and select File Size. You will see a box to choose to select is greater than range and then you can mention any file size to see files larger then that size. All the files grater then mentioned size will be in front of you. These files will be sorted according to year. From here you can choose to delete large files. If you are still finding it difficult to locate large files then you can sort files by Kind. This is how you can find and remove large files on Mac and utilize the free space of your disk. So what are you waiting for? Try this highly useful program and never run out of space on your Mac while keeping its performance up to the mark.